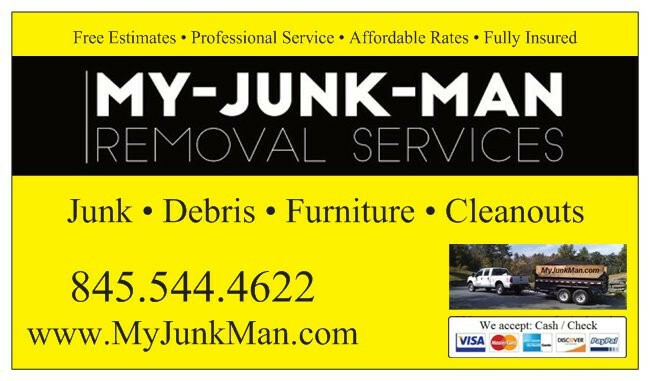 If you are looking for reliable and affordable junk or debris removal for your residential property in Orange County and Warwick NY, My Junk Man has you covered! For years, My Junk Man has been providing full service junk removal and property clean outs for residential/commercial property owners, estate caretakers, renters, and all those people who do not have the means to remove and haul items themselves. Our commitment to provide quality services at affordable rates has made us one of the preferred companies of many residential and commercial property owners in Orange County NY including Warwick, Monroe, Middletown and other cities within the county. ​Whether it is a single item or the entire contents of your property in Orange County, NY our professional team can remove just about anything. From renovation debris, junk or unwanted items, yard waste, furniture, electronics, appliances to property clean ups, you can assure that our team has the knowledge and expertise to safely remove, dispose, sort and clean up any unwanted items you have. Eliminate the hassle of removing your junk and unwanted items by yourselves. Whatever your removal needs, from garbage, construction debris, washers, refrigerator, mattress, couches, office furniture and more, we can safely remove them all. ​​If you need help with any of your junk, debris, clean ups, and recycling services in Orange County, NY, please do not hesitate to contact us at (845) 544-4622 for FREE estimates. Discover why My-Junk-Man has been happily serving residential property owners in Orange County NY for years.